Here’s a little secret that most parents don’t know. Our nation’s national parks can provide free fun and may only be a short drive away. And you don’t have to pitch a tent to enjoy them. A trip to a national park can prove as thrilling as a theme park or as rejuvenating as a tropical vacation. Beyond the 59 well-known parks like Yellowstone and Yosemite, the National Park System consists of more than 400 nationally-recognized and protected places deemed worthy of preserving forever. This year, there’s even more attention shining on the extensive park system as rangers encourage families to visit and celebrate their centennial anniversary. From beaches to urban parks, these oases are everywhere. Coast to coast, major metropolitan areas like Los Angeles and New York City are in close proximity to national parkland, guaranteeing a majority of the country is within a short day’s drive to their next adventure. For example, within a few miles of the densely-packed city of San Francisco, national parkland includes Alcatraz Island, Muir Woods and the Presidio. National parks offer beautiful scenery and memorable experiences at reasonable rates. Parks are often cheaper than an amusement park or tickets to a movie, but they can offer just as much adventure and entertainment. Many are even completely free. Each year, there a handful of days when all national parks are free to the public. National parks aren’t just for backcountry camping and surviving the wilderness. They’re surprisingly family-friendly places for kids and families to explore the world around them. Many parks have approachable activities that teach families the unique story behind each park. 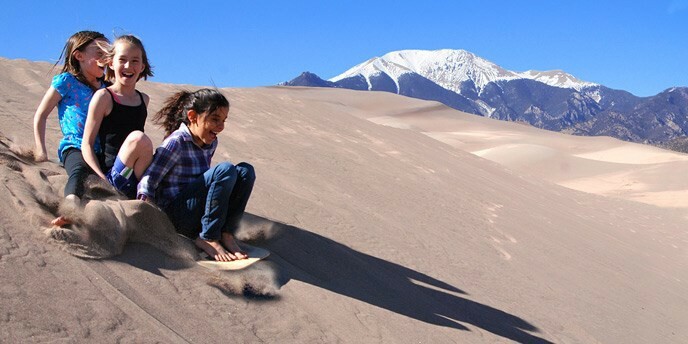 Whether sand-surfing dunes in Death Valley, spotting sea life on a boat in Acadia National Park, or exploring real life bat caves at Carlsbad Caverns, you’re likely to find an activity everyone will enjoy. In addition to unique activities, throughout the park system the Junior Ranger program allows kids to participate in real-world activities and earn badges for their efforts. Most all parks also have great visitor centers with interactive exhibits helping kids learn about animals, geology, and history. For families looking to spend a few days, national parks offer a variety of accommodations, from family-friendly campsites to historic and luxurious lodges. National parks offer some of the most unique places to spend the night — islands, sandy beaches, and canyons.